The orchard is really starting to bear fruit. Every other day it seems Country Boy comes in with a report of what fruit is ready, or a basket of already picked fruit for us to eat. 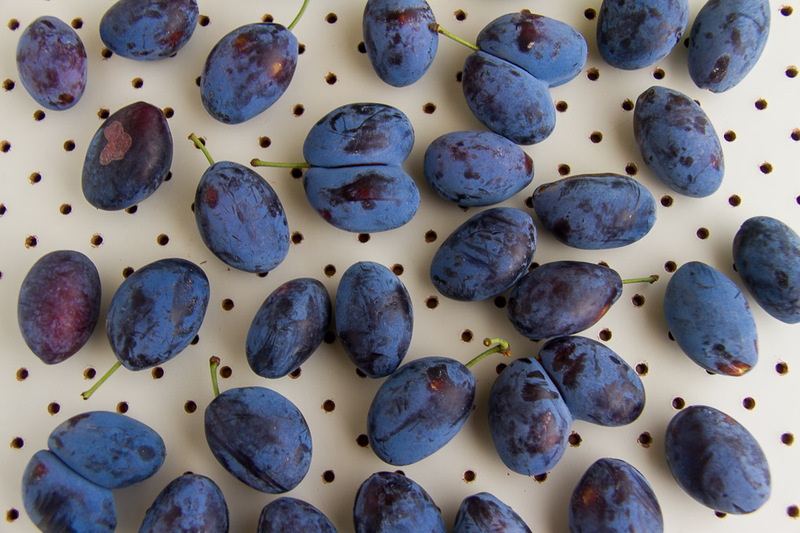 Some, such as apples, are easy because we can eat them raw, but others such as these Italian plums aren’t so easy. While they are not awful or sour, the blood plums and even the wild plums by the creek are better for eating. They are fairly dry, and not as sweet or tangy as the others, so my thought was that they would be good to cook with. 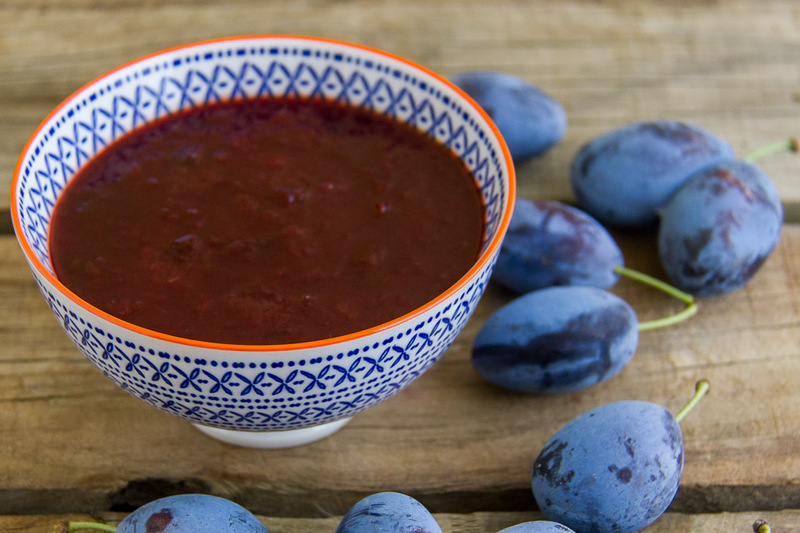 We still have more than enough plum jam to get us through another year, so I decided to have a go at some spicy plum sauce that we could serve with our pork, or even slow cook some pork shoulder in. 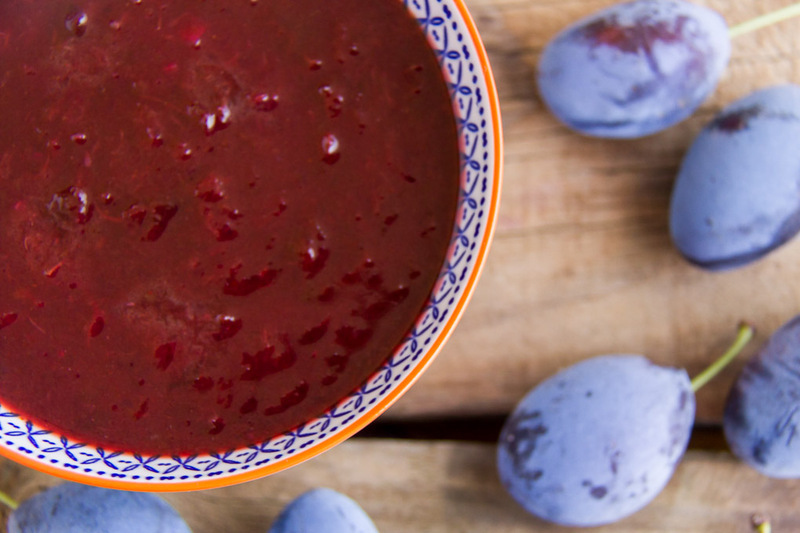 When I was at uni, I remember making a really nice plum sauce, but I have long ago thrown away all my uni notes and resources, so I had a quick scan of the internet for any good recipes, and then made up my own. It turned out beautifully – just a nice, gentle amount of heat. Give it a few weeks for the flavours to mingle and meld, and it will be gorgeous. Peel and roughly chop the onion, garlic, and ginger. Use a food processor to finely chop the onion, garlic, and ginger into a paste. Heat the oil in a large saucepan on medium. Fry the onion paste to soften. Add in the plums, red wine, and cider vinegar. Reduce the heat to a simmer and cover. Stir occasionally until the plums collapse. Turn off the heat and allow the mixture to cool. Once the mixture has cooled a little, use a spoon to remove the pips. Add in the spices, salt, and sugar and bring to the simmer. Continue simmering until the sauce thickens to your desired consistency. If you want a smooth sauce, use a processor to puree the sauce. While still hot, place into sterilised jars or bottles. You can find out how to prepare and sterilise jars in this post. Have you got any suggestions with things we can make with plums? Heaven knows we have heaps more still on the tree! Thanks for sharing Jo. I’ll give it a go. How long do you think it will last? Mine has been on the shelf for over a year.